Whenever we install Java using JDK installer it creates two folders in installation directory one for JDK and one for JRE. However, JDK folder also contains one JRE folder itself and both have the same directory structure. \jdk1.7.0 → This is the root directory of the JDK software installation which contains copyright, license, and readme files, src.zip and all other directories. appletviewer: Run and debug applets without a web browser. extcheck: Utility to detect Jar conflicts. jar: Create and manage Java Archive (JAR) files. java: The launcher for Java applications. javac: The compiler for the Java programming language. javah: C header and stub generator. Used to write native methods. For more information on the tools, see the JDK Tools. tools.jar: Contains non-core classes for support of the tools and utilities in the JDK. dt.jar: DesignTime archive of BeanInfo files that tell interactive development environments (IDEs) how to display the Java components and how to let the developer customize them for an application. ant-javafx.jar: Contains Ant tasks for packaging JavaFX applications; see Packaging in Deploying JavaFX Applications. Other jars are jconsole.jar, packager.jar, sa-jdi.jar. \jdk1.7.0\jre → Root directory of the Java runtime environment used by the JDK development tools. The runtime environment is an implementation of the Java platform. 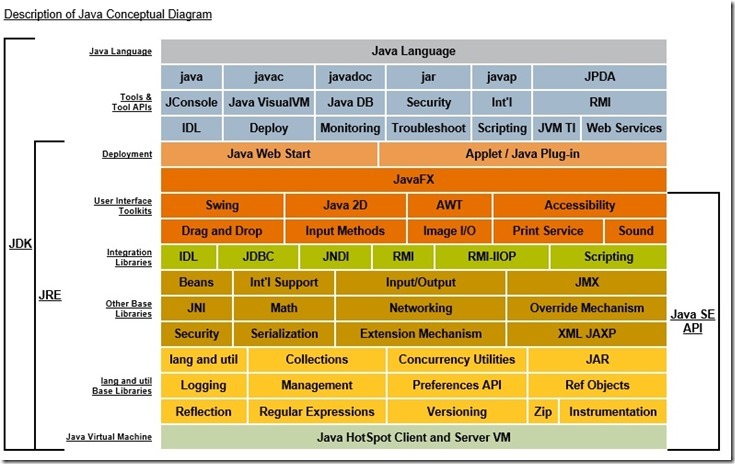 This is the directory represented by the java.home system property. \jdk1.7.0\jre\bin → Contains executable files and DLLs for tools and libraries used by the Java platform. The executable files are identical to files in /jdk1.7.0/bin. The java launcher tool serves as an application launcher (and replaced the old jre tool that shipped with 1.1 versions of the JDK). This directory does not need to be in the PATH environment variable. \jdk1.7.0\jre\bin\client → Contains the DLL files used by the Java HotSpot™ Client Virtual Machine. \jdk1.7.0\jre\bin\server → Contains the DLL files used by the Java HotSpot™ Server Virtual Machine. rt.jar: Contains all Java platform's core API classes. These classes are loaded by Bootstrap Classloader. Aside from the ext subdirectory (described below), there are several additional resource subdirectories not described here. \jdk1.7.0\jre\lib\ext → Default installation directory for Extensions to the Java platform, Loaded by extension classloader. localedata.jar: locale data for java.text and java.util. \jdk1.7.0\jre\lib\security → Contains files used for security management. These include the security policy (java.policy) and security properties (java.security) files. \jdk1.7.0\jre\lib\applet → Jar files containing support classes for applets can be placed in the lib/applet/ directory. This reduces startup time for large applets by allowing applet classes to be pre-loaded from the local file system by the applet class loader, providing the same protections as if they had been downloaded over the net. \jdk1.7.0\jre\lib\fonts → Contains TrueType font files for use by the platform. \jdk1.7.0\src.zip → Archive containing source code for the Java platform. \jdk1.7.0\db → Contains Java DB. \jdk1.7.0\include → C language header files that support native-code programming using the Java Native Interface and the Java Virtual Machine Debugger Interface.